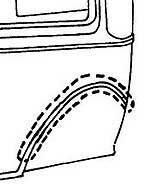 Quarter Panel Bead Repair 1930-31 Right. Repair patch for the bead in the quarter panel of Tudors. Goes above bead about 1" and goes inward about 3/4". Quarter Panel Bead Repair 1930-31 Left. Repair patch for the bead in the quarter panel of Tudors. Goes above bead about 1" and goes inward about 3/4". Rear Quarter Patch 1928-29 Coupe. 6" high. Made in USA. Available in pairs only. Rear Quarter Patch 1930-31 Coupe. 6" high. Made in USA. Available in pairs only. Rear Quarter Patch 1928-29 Roadster. 6" high. Made in USA. Available in pairs only. Rear Quarter Patch 1930-31 Roadster. 6" high. Made in USA. Available in pairs only. Rear Quarter Patch 1928-29 Tudor Sedan. 6" high. Made in USA. Available in pairs only. Rear Quarter Patch 1930-31 Tudor Sedan. 6" high. Made in USA. Available in pairs only. 1928-29 Roadster lower deck lid panel. This is the replacement panel that fits below the boot lid. 1928-29 Coupe lower deck lid panel. This is the replacement panel that fits below the boot lid. 1930-31 Roadster and Coupe lower deck lid panel. This is the replacement panel that fits below the boot lid.